Please join us on Saturday, May 11th at Berkley Riverfront Park for the third annual Legacy Walk! We are excited to host donor families, recipients, hospital partners and members of our community to celebrate life and enjoy a day of fun. We encourage you to gather you families, friends and colleagues and participate in this event! Individual or Family	 To register yourself or your family, enter the number of RSVP's in the box to the left. In consideration of participation in the Legacy Walk at Berkley Riverfront Park on May 11, 2019 the undersigned person (s) HEREBY RELEASES MIDWEST TRANSPLANT NETWORK, INC., its officers, employees, volunteers, officials and agents from any and all claims, liability, loss of services and causes of action of any kind for personal injury and property damage arising in any way out of said participation. 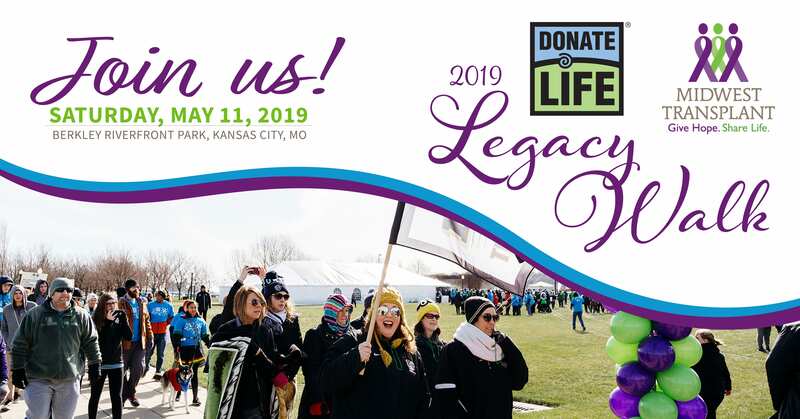 As a participant in the Legacy Walk, I hereby release and allow Midwest Transplant Network to take photographs of me at events, which may be used in Midwest Transplant Network publications or publicity. By clicking the box to the left, I hereby have read the above, I understand this release and I agree to all of its terms. Be sure to check your confirmation email for a link to the Legacy Walk T-Shirt store. Team Registration	 To register an entire team or to join a team, enter the number of RSVP's in the box to the left.